The most commonly asked question I get from my blog followers are, where do you buy those generic nanoblock bricks to build your creations ? I finally answered that in an article over here. Here is how I actually go about designing my nanoblock creations. Yes, theoretically, pretty much anything can be build using nanoblock. The question is : (a) How detailed do you want it (b) How big do you have to build the model in order to achieve the required level of detail (c) Do you have enough bricks to actually build it. So when you choose to build something, these 3 factors have to be considered. After deciding what to build, I would do a Google Image Search of the item I want to build. So, for example, when I wanted to build a Smurf, I search for images of Smurfs, and try to get a few pictures of Smurfs from multiple angles. That allows me to study the subject's structure in 3D, and I can visualize it in my head. While nanoblock is relatively small, it is still quite big, making it impossible to capture every single little detail unless you build your model extremely huge. That is probably not very practical, so you have to decide what are the defining features of the model that must be captured in your design in order for it to be recognized as what you are trying to build, and what are non-essential. Don't try to capture every tiny detail. After getting a 3D mental image, I normally start building from the smallest significant detail. The reason is because this will determine the scale for the rest of the model. Take for example, if the smallest significant detail is the eyes, and you need to have a single black block surrounded by white blocks to build an eyeball, everything else have to be scaled accordingly, since you can't build the rest of the model at a smaller scale than that. So, if a single eyeball is 3x3 blocks, two eyeballs would be 6 blocks across, you can't build your head with a width smaller than 6 blocks, or the eyes wouldn't fit. Once I have visualized in my head on roughly how to map a 3D structure to nanoblock design, I would more or less get what I expected when building it, but not always. There will be things that seems like it should work in your head, but when you actually build it, it does not come out how you expect it to be. So, you have to refine your design, like how a sculptor creates a sculpture. You make little tweaks here and there, until you get the shape you want. This is where the small 1x1 and 1x2 bricks comes in really handy for fine tuning your design. That is pretty much the whole process that I go through when designing my nanoblock creations. If you want to take pictures of the build process for your creation, the easiest way to do it is actually to shoot pictures of the disassembly process, and reverse the order of photos to get the build instructions. Thank you for reading, and I hope this helps in getting you started with creating your own nanoblock designs. 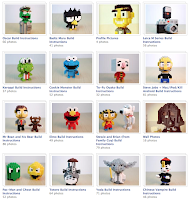 Do check out my nanoblock creations over here. Thank you Chris for the big tips and thank you for building the suuuuuperb city in East Point City! !